Effect: The spectator selects a card and places it back into the deck. After placing the deck behind your back and bringing it out again, the selected card is shown to have reversed itself in the deck. Secret: You have secretly reversed the top card so the deck looks as if it’s face-down when it’s really face-up. When the spectator places his or her card back into the deck, the selected card is reversed and facing the other way. When noone is around, prepare the deck by reversing the bottom card so it’s facing the other way. Note that the picture above is strictly for explanation. 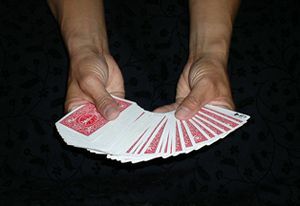 As you perform the trick, the spectator should never notice that the bottom card is reversed. Take out the deck and spread the face-down cards so the spectator may choose one. Be careful that you don’t show the bottom card that is reversed and facing the other way. When the spectator is looking at the card and showing it to other people, casually turn the deck over so the reversed card is on top. As long as you hold the deck together without spreading the cards, it will look as if the deck is face down. The picture above is for demonstration purposes only. It shows the current orientation of the deck in your hands. The top card is the only one that’s face down and the rest of the deck is face up. Keeping the deck together and without spreading it, shove the selected card back into the deck. Be careful that you don’t show that the other cards are reversed. It should look as if the card when into a face-down deck when in reality, the card went face-down into a face-up deck (with the exception of the top card). Put the deck behind your back and secretly turn over the top card. The selected card is now the only one in the deck that is facing the other way. 6. Bring out the face-up deck and spread the cards. When you reach the only card that is face down, you can slowly turn it over to reveal the spectator’s chosen card. Practice the trick until you can smoothly perform it. Never repeat a trick.